This is an amazing kit that is two kits in one! Use the Everyday Essences aspect of it as a family first aid kit. Use the 100 Day Process with these same essences to create a powerful journey towards wholeness and fulfillment. This kit includes 20 stock essences bottled in 1/2 oz Miron violet glass bottles and a color chart insert boxed in a sturdy and beautiful kit box. 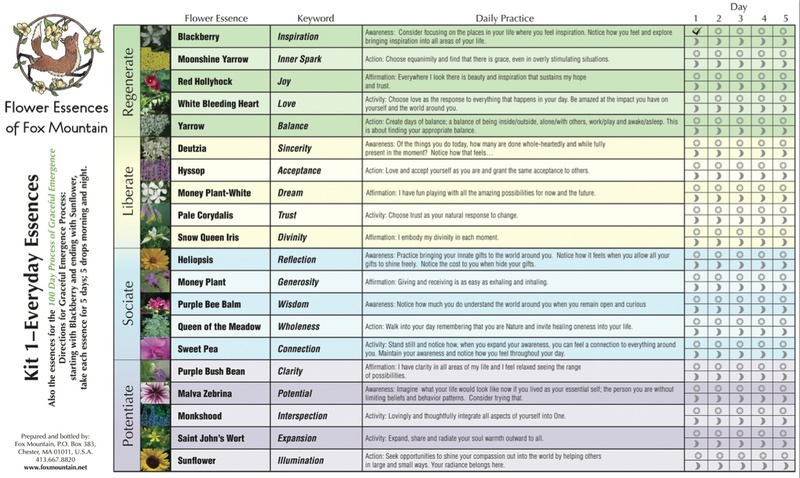 The essences have different colors on their labels to represent the category that they fall into for the 100 Day Process. The kit box lid has a map to make it easy to find the essence you're looking for. 20 essences; something to address almost anything that comes up. Your family's emotional first aid kit and support for balanced fulfillment. Read the back of the chart pdf here to see what this kit has to offer. This is a process that involves starting with Blackberry and ending with Sunflower, taking 5 drops of each essence morning and night for 5 days. There are practices that go with each essence that support opening our awareness to our large and small life choices, creating shifts in our energy field and enhancing our ability to show up fully in the world to share our gifts. Look at a pdf of the chart that creates this process by clicking here. Below is a list of the essences included in this kit. They are available here individually as replacement bottles to keep your kit full. Ordering them on this page guarantees that they will have the labels that match the other essences in the kit rather than the regular individual essence labels. No matter the label, the essence is the same.